Yesterday at Copyblogger I posted The Jersey Shore Guide to Irresistible Personal Branding. It was a somewhat quirky piece about how those greasy Jersey Shore kids have used their oddities, drama and knack for polarization to create their own platform and personal brands. I wrote it after noticing that each of The Jersey Shore cast members now has his or her own product to hawk, from vodkas to T-shirts to bestselling books. A day later, I was really happy to see the positive reaction the post sparked from the Copyblogger audience. Well, except for the one gal who thinks I ripped her off. Click for full comment thread. It gets better. Ahlam Yassin has a blog called ProWriterInc where she says she’s ‘changing the world one word at a time’. Last month she wrote her own Jersey Shore-related personal branding post. 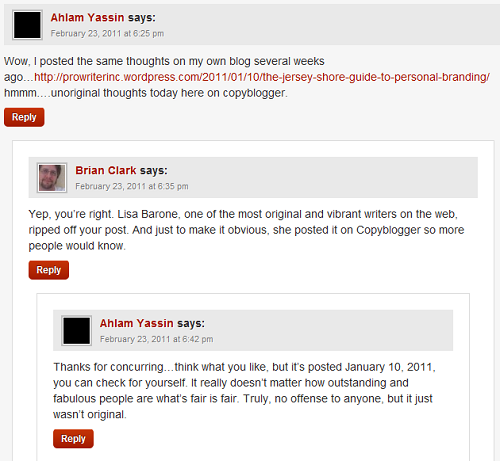 Ahlam thinks I saw her post and then ran to Copyblogger to copy her, writing and publishing mine. Ah, if only I was that clever. Or had that much time. You probably won’t be shocked to learn that Ahlam and I are NOT the only ones on the Internet to see a connection between The Jersey Shore and marketing. David Trahan penned a Jersey Shore marketing post for Dan Schawbel’s Personal Branding Blog on August 5, 2010. Jacob Pratt wrote his own on August 9, 2010. Perhaps none of us were riding the originality train with that post, but it doesn’t matter. Because it’s not the idea that means anything. It’s the execution and what you do with it. You want to launch a flower shop in your neighborhood? DUDE, ALREADY DONE! You want to quit your job and become an entrepreneur? BEAT YOU! You want to write an SEO blog where, every day, you share tips and advice for how to optimize your Web site to help you attract clients? Pfft! The Web’s LITTERED WITH THEM! You want to write about your life, your kids and insights about the things around you? Um, the mommyblogger train has LEFT THE STATION! Frankly, your idea isn’t worth the paper you write it on. What you do with it is different. The hard truth is that no one stole your idea, they just executed better. If they hadn’t, you would have even noticed it. I live in an echo chamber. I write about SEO, social media and branding. So does everyone else. But, at Outspoken Media, we stand out. Because of how we do it. We’re interesting, we’ve built a platform, and we use what’s unique about us to get your attention. We don’t just write about The Jersey Shore’s Guide to Personal Branding – we live it. That’s the difference. You can accuse me of copying you, call me a fake – whatever. There’s a reason you saw my post on the topic but maybe didn’t see Aslam’s. The reason isn’t because I’m smarter, but because I put mine where you’d notice and wrote it in a way to make you care. It’s not the idea. It’s the execution. And trust me, I’ve found myself on the wrong side of that equation more times than I’d like to admit. But this isn’t about dueling blog posts, it’s about business: Don’t stray way from doing things just because your competitors did them first – just have a plan for how you’ll do it better and in a way that stands out and demands attention. True innovation or that one MAGIC idea is pretty rare, if it exists at all. A few months ago, Dawn and I were trying to think of the last original marketing idea for Alan K’nect’s book contest. Ultimately, she decided she hadn’t seen one in her lifetime. Typically what you’re competing on is your ability to deliver a better experience, better quality, a better way of doing something. It’s nothing something never before seen. Coke or Pepsi? Mac or PC? NSYNC or Backstreet? They’re all the same until you show me they’re not. Who cares about your idea? Show me what you can do with it. Home › Internet Marketing Blog › Online Marketing › There Are No More Original Ideas. Now What?